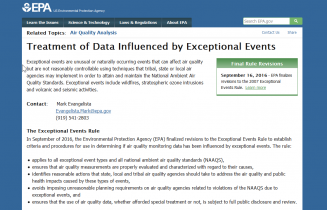 The Exceptional Events Rule (EER) provides a way for states to flag air quality data for possible exclusion when NAAQS compliance is determined, provided the EPA concurs with the supporting documentation, and the event contributing to the data meets certain criteria. Exceptional Events are those events that impact air quality but are not reasonably controllable, and not likely to reoccur. Wildland fires are among the exceptional events states flag under this rule.